Hosting a Christmas party can be fun for you when you plan it well. You know who your guests will be, now it’s time to plan the party and pick your invitations. Making use of the invitation design elements can help you plan the decor, menu, even a theme for your holiday party. There are multiple ways you can host a Christmas party, but my favorite is an open house. The entire month of December is usually a hectic one for most of us. Your guests will Christmas shopping, decorating their own house, attending other parties and still try to continue daily lives with work and school. Offering them the option to attend your holiday party for as short or as long as they want is a considerate gesture. A holiday open house is actually easier on you as the host, as well. You set a time span of usually 3 hours, and you serve easy buffet-style appetizers and snacks. There is no need to plan activities, your guests arrivals and departures will be the biggest activity. Set the tone for your party with the invitations. An elegant invitation will tell your guests that this is a classy event. Most guests will match their attire to the type of invitation. In turn, you match the food and drink to that tone. With an elegant tone, drinks like champagne or champagne punches work well. If you like a more casual Christmas party, a fun invitation will tell your guests that. Stopping in on the way home from a day of mall shopping is perfectly acceptable with these kinds of invitations. With an open house holiday party, you definitely want to go with a buffet-style for both food and drink. Guests will be arriving as their schedules allow. Keep the food options to finger foods, things that your guests can pick up and carry with them as they chat with other guests. Be careful of too many foods that must be served fresh from the oven. Besides the fact that means you are spending more of your time serving food than enjoying your party, not all of your guests will be able to enjoy the hot food. Choose menu items that are prepared ahead of time, then can be easily replenished on your buffet table as your open house continues. This makes it easier for even your latest arriving guests to enjoy the food without it appearing as though they are at the end of your food service. Remember to spend your time enjoying your holiday party as well. Excellent tips and ideas for planning a Christmas party! And, I love the party invitation suggestions! 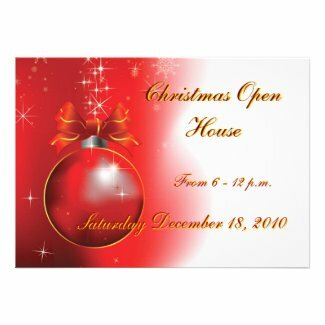 These are beautiful Christmas and Holiday Open House invitations! We do get several each year and the invitations really do surprisingly affect which open houses we actually accept and attend.